Why make a New Years resolutions unless it will have a positive impact, right? If you have a dream that you've given up on due to time, past failure, or discouragement, pick it up again. If there is a skill or sport that you always wanted to be better at, out it into your schedule. There is no time like the present to go after your aspirations and goals. You never know where it will lead you. Likewise, try something new that may increase your health or happiness. It's easier than ever to find healthy recipes or purchase healthy alternatives. Pick one day of the week to indulge in your favorite junk food, but research the majority of the week to eating healthy. As they say, "you are what you eat". Quality time with close friends and special family members is priceless. Cut out negative relationships and avoid unnecessary drama that only results in stress. Seek out people and relationships that bring out the best you. Make 2014 the year of wellness. 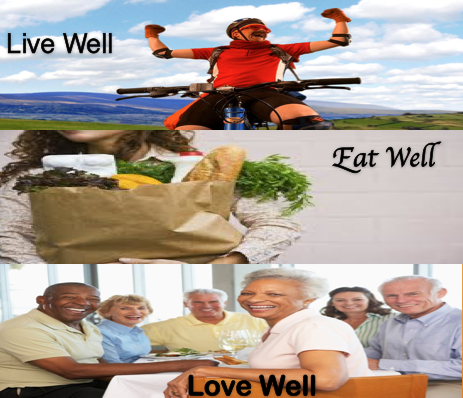 As you live well, eat well, and love well, you will notice that ultimately you are prolonging your years of healthy and happy living. Join me on Monday, December 30th at 7pmET for a Tweetchat at #Nurseup to share your New Years Resolutions to Live well, Eat well, and Love well. I'll be sharing mine as well! My name is Leah Korkis and I am a nurse and caregiver. I'm founder of Healthy Now and Later, a site and forum devoting to health living for caregivers and those 55+. Hope to see you then!